Wilfrid Lupano was born in Nantes, in the west of France, and spent most of his childhood in the southwestern city of Pau, France. He spent his childhood reading through his parents' comic book collection and enjoying role‑playing games. He studied literature and philosophy, receiving a degree in English, before he began to script comics. He has written numerous graphic novels for French readers, including the series Les Vieux Fourneaux (in English, The Old Geezers). 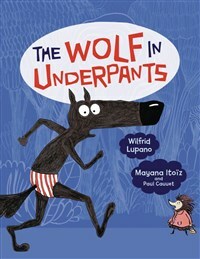 With this series, Lupano and Paul Cauuet first developed the idea that would become The Wolf in Underpants. Lupano once again lives in Pau after spending several years in the city of Toulouse. Mayana Itoïz was born in the city of Bayonne, in the southwest of France, and studied at the institut supérieur des arts de Toulouse (School of Fine Arts in Toulouse), where she worked in many different mediums. In addition to being an illustrator and a cartoonist, she has taught art to high school students. She lives in the Pyrenees, near France's mountainous southern border, and splits her time between art, family, and travel. Paul Cauuet was born in Toulouse and grew up in a family that encouraged his passion for drawing. He was also a fond reader of classic Franco-Belgian comics such as Tintin and Asterix. He studied at the University of Toulouse and went on to a career as a cartoonist. Cauuet and Wilfrid Lupano first collaborated on an outer-space comedy series before working together on Les Vieux Fourneaux (The Old Geezers).